One local state lawmaker says during a time when downtown Buffalo has enjoyed an economic renaissance, the announced forthcoming acquisition of First Niagara by KeyCorp could deal a devastating blow to the local economy. Michael Kearns is urging leaders, including Governor Andrew Cuomo, to look into the planned merger, which he fears will result in significant layoffs at First Niagara's Larkinville-based headquarters. Assemblyman Michael Kearns is expressing concerns over the proposed acquisition of First Niagara Bank by KeyCorp. "When you look at KeyBank's website and you look at their investor profile, one thing that they do say is that they're going have to eliminate $400 million. Where's that going to come from? To me, it's going to come from job cuts and I think it's going to have a major impact on the Western New York economy," Kearns told WBFO. Kearns added that KeyBank, which is owned by Cleveland-based KeyCorp, is one bank he is calling out for neglecting its foreclosed properties. He questioned how a company not taking care of those properties can then acquire another bank. "We are going to shame KeyBank. We're going to show that they can't even maintain the properties that they foreclosed upon and then they want to take on another institution," Kearns said. "I will be writing a letter to the governor's office, asking him to look into this matter." KeyBank has just under 1,000 branches in 12 states. UPDATE: A spokesperson for KeyBank replied to our request for an interview with a written statement received very late Monday. It reads: "With regard to potential job loss, particularly in Buffalo, it’s still very early in the process. 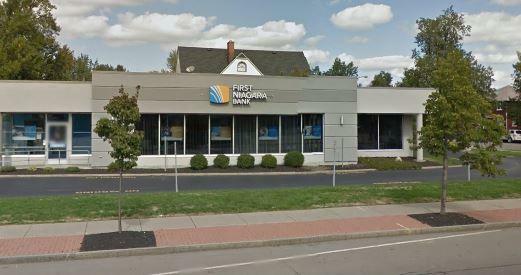 Together, Key and First Niagara will create a stronger, more powerful regional bank. We recognize that banking is a people business. To succeed, we need to draw on a wide range of experience, talent, and capabilities. We will be thoughtful in how we approach the integration and combining our companies. As with any combination of this size, however, we expect there will be some overlaps in job functions. It is premature to speculate on specific numbers; that said, we are committed to treating all employees with respect and dignity throughout this process. "Additionally, it’s important to recognize that both KeyCorp and First Niagara have built a legacy of philanthropy and civic involvement and will continue this commitment to the markets the combined company will serve. Together, the combined companies have nearly $5 billion in lending and investments supporting underserved individuals and communities. Additionally, Key will make a $20 million contribution to the First Niagara Foundation to continue its important community initiatives. " KeyCorp announced Friday it has reached a deal with First Niagara Financial Group to purchase the bank for $4.1 billion. Reacting to Friday morning's confirmation that KeyCorp is buying First Niagara, local leaders say they will work to preserve jobs that many fear will be lost as part of the deal. Listen to Michael Mroziak's report.